We just held our fourth week of the Hacking for Defense class. This week the teams turned the corner on understanding beneficiaries and finding product/market fit. The 8 teams spoke to 115 beneficiaries (users, program managers, etc. ); we sent each team a critique of their mission model canvas; we started streaming the class live to DOD/IC sponsors and other educators; our advanced lecture explained how to go from concept to deployment in the DOD/IC; and we watched as the students got closer to understanding the actual problems their customers have. In-between class sessions, we reviewed each team’s mission model canvas and sent them a detailed critique of each of the boxes on the right side of their canvas. The critiques seemed to make a difference in this week’s presentations with a noticeable improvement in teams’ beneficiaries/stakeholder understanding. The teams are beginning to understand that beneficiaries mean “Not the name of an organization but all the stakeholders in an organization (users, program managers, saboteurs, legal, finance, etc. )” and that they can’t really understand customer problems until they can diagram the relationships among all the beneficiaries. Then, and only then, can they move on to developing a detailed value proposition canvas for each of the beneficiaries. Some of the sponsors commented that the teams had a better grasp of the problem space and a deeper understanding of the beneficiaries and their relationships to each other, than they did. Great technical teams like often want to use the class as a product incubator when we want them to spend an equal amount of time learning about the rest of the Mission Model canvas. What we’re trying to prevent is to have teams give the DOD/IC yet another great technology demo. They have plenty of those. What teams need to do is deeply understand all the stakeholders in their sponsor organization (analysts, seniors, finance, legal, etc.) so they can get a great product that solves real problems and can be widely deployed quickly. Narrative Mind had an amazing week. The sponsor’s brief to the team is to figure out how to understand, disrupt, and counter adversaries’ use of social media. After 46 interviews the team could see that there were conflicting definitions of what problems needed to be solved. They realized that different beneficiaries were each describing a different part of a much bigger picture. Take a look at slide 3, as the team synthesized and then summarized the sum of the hypotheses the beneficiaries have of the problem. This was a big learning moment. Slide 4 was another insight as they mapped out who actually owned the problem across multiple DOD and Intelligence organizations. Finally, their beneficiaries on slide 6 were focused and clear. This team is learning a lot. Right of Boom had an insightful week with 19 customer discovery interviews this week across a broad range of beneficiaries. (See slide 2.) These interviews led them to conclude that their initial hypotheses (slides 3-5) were wrong. 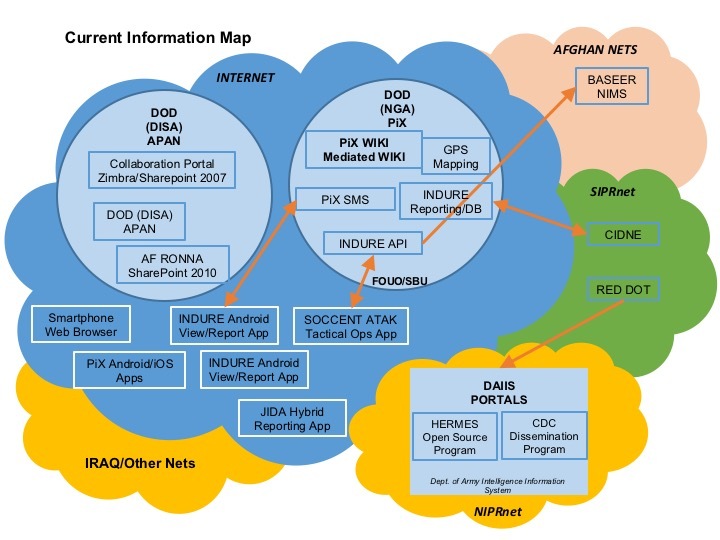 In slide 6 they were able to map out the entire IED (Improvised Explosive Device) reporting information flow. And in slide 7 the team really narrows down their beneficiaries and value proposition. They came to an interesting conclusion about how to measure success in their Mission Achievement box. Sentinel initially started by trying to use low-cost sensors to monitor surface ships in a A2/AD environment. The team has found that their mission value is really to enable more efficient and informed strategic decisions by filling in intelligence gap about surface ships. aquaLink started the week believing they were working to give Navy divers a system of wearable devices that records data critical to diver health and safety, and makes the data actionable through real-time alerts and post-dive analytics. This was a great but painful week for the team as they experienced a bit of an existential crisis while working to drill down into who their customer truly is. The original problem statement from their sponsor asked for a wearable sensor that would monitor the physiological status of divers. As they proceeded with customer discovery, the team found that the majority of the operators who would wear these sensors were ambivalent about the introduction of a vitals monitoring platform, but were much more excited about solving geolocation problems. On the other hand, the medical professionals and some commanders were more interested in monitoring physiological metrics in order to understand chronic long-term health issues facing divers and optimize short-term performance. Slides 2-6 illustrate aquaLink’s evolving understanding of the range of customer archetypes. Their key take-away was that they would have to decide which beneficiary to focus on. They decided to focus on the operators and divers within SEAL Delivery Vehicle Team One, along with their immediate chains of command in SDVT-1 and Naval Special Warfare Group 3. These were the beneficiaries who viewed aquaLink’s focus on geolocation as the most valuable. See slides 7, 11 and 12. The team recognized that it was time for a pivot and aquaLink will spend the rest of the class focusing exclusively on geolocation. Skynet is using drones to to provide ground troops with situational awareness – helping prevent battlefield fatalities by pinpointing friendly and enemy positions. The team made progress understanding the Special Operations Command (SOCOM) acquisitions process in slides 3-5 and mocked-up an MVP. However, they still list organizations as beneficiaries. We asked that they dive deeper into the each of the stakeholders and create a diagram of how the beneficiaries actually interact. Capella Space is launching a constellation of synthetic aperture radar satellites into space to provide real-time radar imaging. The team made progress understanding that some beneficiaries want raw SAR imagery and some want analytics. They are starting to understand the beneficiaries in the Coast Guard; however, they are stymied in trying to find the right people to talk to about commercial data acquisition at the National Geospatial Agency. We asked that they dive deeper into each of the stakeholders and diagram how the beneficiaries actually interact. Guardian’s problem to solve was to counter asymmetric drone activities. This week was a big leap forward in truly understanding their problem and beneficiaries. They did a deep dive (slides 5-7) into really understanding what, exactly, is a forward operating base. They refined their options of the problem space (slide 4) and did a great job of truly understanding the workflow in slide 8. Their mission model canvas in slide 9 had a great update on their beneficiaries while the detailed value proposition canvases in slides 10-12 gave great insight about the pains/gains/jobs to be done those beneficiaries had. This week Jackie Space and Lauren Schmidt gave the advanced lecture. Jackie, an exAir Force officer who spent her career managing overhead reconnaissance systems, flies up from LA every week and has now officially joined the teaching team. Lauren is a member of the Defense Innovation Unit Experimental (DIUx) based at Moffett Field in Mountain View and advises our students in the course along with multiple other members of the DIUx. Slide 5 “purchasing authority” and Slide 6 “key activities” were real eye-openers for the team. A few of the teams are now writing weekly one-page status reports to their sponsors and mentors. Great idea to keep them informed and make them feel they’re part of the team. It’s been fun to watch as the teams learn from sponsors; a few teams have been broadening their sponsors understanding of the problem. (How do we know this? When the sponsors asked their team, “Can we use your slides to present to our organization?”) That’s a win for everyone. This week we had one group of students volunteer to go to Iraq or Afghanistan to see the customer problem first-hand. Travel restrictions and other logistical challenges will likely make this trip infeasible, but the team’s genuine interest in getting to the ground level of customer discovery reflects well on their commitment to the principles of the course’s methodology. We just held our third week of the Hacking for Defense class. This week the 8 teams spoke to 108 beneficiaries (users, program mangers, etc. ), we held a Customer Discovery workshop, we started streaming the class live to DOD/IC sponsors and other educators, our advanced lecture was on Product/Market fit for the DOD/IC and we watched as the students solved their customer discovery obstacles and started getting closer to their customers. We normally hold a Customer Discovery workshop during the evening the first week of the class. But spring break and the “How to Work with the DOD” workshop got in the way. So we inserted an abbreviated version at the front of this week’s class. When working with the DOD/IC there are some unique obstacles of “getting out of the building and talking to customers”. For example, members of the DOD will not respond to ”cold calls” and those in the Intel community won’t even tell you their names. In addition, most of the sponsors are working on classified problems. So how do teams understand the customer when the customer can’t tell you what they do? The Workshop talked about how to address those and other Discovery issues. After the Customer Discovery workshop the 8 teams presented what their hypotheses, experiments and what they learned outside the building this week. Team Right of Boom (previously named Live Tactical Threat Toolkit) is trying to help foreign military explosive ordnance disposal (EOD) teams better accomplish their mission. The team originally was developing tech-centric tools for foreign teams to consult with their American counterparts in real time to disarm IED’s, and to document key information about what they have found. Now they are honing in providing accurate high-volume post-incident IED reporting. is launching a constellation of synthetic aperture radar satellites into space to provide real-time radar imaging. Team aquaLink is working to give Navy divers a way to monitor their own physiological conditions while underwater (core temperature, maximum dive pressure, blood pressure and pulse.) Knowing all of this would give divers early warning of hypothermia or the bends. Team Guardian is working to protect soldiers from cheap, off-the-shelf commercial drones. What happens when adversaries learn how to weaponize drones with bullets, explosives, or chemical weapons? Guardians current hypotheses is that they have to provide drone detection, identification and protection against attacks from drones or swarm of drones. And that the user will be a 19 solider not trained to use complex equipment. Team Narrative Mind is trying to understand, disrupt, and counter adversaries’ use of social media. Current tools do not provide users with a way to understand the meaning within adversary social media content and there is no automated process to disrupt, counter and shape the narrative. The team is coalescing around the idea that the two minimal viable products for their sponsor are, 1) automatically generate an organizational chart of a target terrorist groups over time, and 2) generate a social network map of how terrorist groups interact with each other. Team Sentinel initially started by trying to use low cost sensors to monitor surface ships in a A2/AD environment. The team invalidated the hypotheses that military/commercial systems exist that could already solve the problem. In addition, they originally believed that soldiers on foot needed a deployable drone system. They discovered that drones are best used with teams with vehicles or for short ranged dismounted operations. The advanced lecture for week 3 was on the unique needs of finding Product/Market fit in the DOD/IC. Pete Newell described why a solutions in the DOD fails and then described “battlefield calculus” – how two identical sounding missions (and their inherent problems) are actually radically different based on what echelon of force executes them, by the size of force, their location, even by how well they are trained. Despite the obvious, people still try to deliver “one-size-fits-all” solutions. To properly insure a solution is actually used it is important to become familiar with the pattern of life of the user and their unit. Pete also pointed out that teams need to “Look for Conflict” between what may have been provided to solve a similar problem and the solution the teams are about to recommend. You needed to ask: Are the circumstances similar? Or are their a myriad of conditions present that will invalidate what was a good solution under different circumstances? To students, “who are the beneficiaries?” feels fuzzy on day one. And given most of them had no exposure to the DOD or Intel Community it’s not a surprise. The reason we have the teams talk to 10-15 people every week, is that with enough data they can begin to fill in the details. A few of our guests have commented how knowledgeable the teams were in talking about the sponsor organizations and problems. That said, listening to the team presentations there was a wide difference between teams in how well they understood that the definition of “beneficiaries.” Many of teams were still listing names of organizations rather than the title and archetype of the people who mattered/cared/decided/users, etc. Understanding who are the beneficiaries is critical to understanding the rest of the mission model canvas. This is all par for the course and part of the student learning. We now need to sharpen their focus. An after class action for the teaching team is to read through every team’s week 3 presentation slide-by-slide and give each team a detailed, written, box-by-box critique of the right-side of their Mission Model and Value Proposition Canvas. We want to help them get this right. One emerging unexpected benefit, is that Pete and Joe are continuing to expand the network of innovators in the DOD/IC who are helping our student teams. I’ve had several critique our presentations and offer suggestions on the nuanced parts of the IC mission and acquisition system I didn’t understand. Understanding beneficiaries is critical to understanding the rest of the mission model canvas. If I had spent less time on the business and more time with the family, we’d have been better off as a business and as a family. And if others don’t get your startup idea, it won’t matter how hard your team works to try to achieve it. Balancing business and family, and ensuring demand for your product were key lessons shared by two veteran entrepreneurs on today’s Entrepreneurs are Everywhere radio show. Magdalena Yesil is a founding board member and first investor of Salesforce. In Silicon Valley for three decades, spent eight years as a partner at US Venture Partners. Before she was an investor, Magdalena founded two electronic commerce companies, CyberCash – a pioneer in the secure electronic payment systems, and MarketPay, an embedded payments software company. Magdalena: … you can have a fantastic idea, you can have a great team, you can have what you believe is a great market opportunity but you can die at the end so none of those are sufficient. Magdalena: What we missed was capital … We spent three years on developing and actually even structuring deals to buy Internet access companies out of Stanford and out of MIT, and no venture capitalist would give us a penny. Steve: Because they didn’t get it? Magdalena: (Nods)… They did not believe that taking a nonprofit from a university and turning it into a commercial entity made any sense. There was no demand in companies for using a wide area network like the Internet and they didn’t believe that the demand would ever be there so we got no funding. We had to fold after three years of not making a dollar. Basically, it was a very sad end. …If my father and if I, when I was younger and my children were growing, spent less time on the business and more time with the family, we’d have been better off as a business and as a family. (When I running the company) I would do extra travel to enhance the personal relationship with our customers across the United States. To do that, I had to sacrifice time away from my son and daughter and wife as the kids were growing. I didn’t get to as many ball games or soccer or whatever as I would have like to. I got to probably ten times as many or a hundred times as many as my father got when I was growing up, but still not enough. … you can drive your children away from the business if they are jealous of the time you spend in business rather than the time you spend with them. Magdalena: Curiosity drove me more so than anything else. Technology is a fantastic field if you’re a curious person because there’s always something new to learn. My career pretty much mirrors Silicon Valley; because I always wanted to get on the next wave. I was always curious to find out what the next developments were. I moved from semiconductors to systems then from systems to software, then from software to online services. Steve: But you weren’t qualified, you didn’t have 15 years of experience in any of these things. How did you get those jobs if you know nothing about them? Magdalena: But you’re never qualified in technology. Everyone’s a newbie because when there’s a new wave happening, no one knows really the depths. We all figure it out together. The key isn’t to know a lot, the key is to know more from the guys next to you. Magdalena: It’s really studying up. My skills as a student even today are in good use. Always studying up, always trying to figure out how you can learn as to where the research is, where the developments are, having a very good mind as to where the potential market opportunities might be. Magdalena: I always did. I always have. … curiosity drives most technologists. Let’s face it. When there’s a new technology that’s emerging, there’s very little information about it but the only thing you can do is speak or look at the research that’s going on. Today, it’s not just what’s happening here in Silicon Valley but internationally and then apply yourself and become a specialist. Michael: We loved to take European wines – whether it was a great Burgundy or great Bordeaux – that would cost three to 10 times the price of ours and put them on the table next to our California wines and have people taste them blind. The question we asked was not, “Which wine is better?” We asked, “Do these wines belong to be on the same table complementing this meal?” The majority of the time people preferred drinking our California and Napa wines over the Bordeaux or Burgundy ones. Before that, restaurateurs would never compare California with France. It was “France is great” and “California is jug wine.” Time after time after time we had to take our wines and do tastings side by side against the first growth Bordeaux. Michael: Back then, the average wine drinker had to be over 50 years of age because the people below 50 were into cocktails. They didn’t care about wine. My thinking was graduate students are going to want to learn about wine. They’re going to be able to afford wine and who else to become your ambassador? If we didn’t do something with that wine and convert the liquid to cash in a relatively short period of time, we would have gone bankrupt. I went home and took all of these different cabernet, pinot noir grape varieties and I put all the red together in a blend and all the white together in a blend and I called it “red table wine” and “white table wine,” put it in a magnum bottle with a cork and was able to convert that wine into cash in a period of a year and a half. … No one had done that before. in 1974 60% of all wine sold was in half-gallon jugs with a screw cap and a handle called “Burgundy” and “Chablis.” I was the first one to put a quality wine in a magnum bottle with a cork and call it red table wine and white table wine. It mainly sold through restaurants. …They were selling a glass of Chablis for $1.25 a glass, but the Chablis was kind of sweet and didn’t invite you to have a second glass. I convinced the restaurateurs to sell mine for $1.50 a glass. It would cost them a little more, but they’d sell 2 or 3 glasses because the wine was drinkable. We just held our second week of the Hacking for Defense class. This week the 8 teams spoke to 106 beneficiaries (users, program mangers, etc. ), we held a DOD/IC 101 workshop, our advanced lecture was on the Value Proposition Canvas, and we watched as the students ran into common customer discovery obstacles and found new ones. We started the week by holding a Monday night workshop – DOD/IC 101. Our goal was to give the students with no military background a tutorial on the challenges facing DoD/IC in the current asymmetric threat environment, how the DOD/IC defines its missions and specifies the products it needs, how it accomplishes these missions and how they get to their ultimate user. This knowledge will help the students understand the overall environment that their Mission Model Canvas is operating in. We posted the slides here and more important, an annotated narrative for each of the slides here. It’s truly a landmark presentation. Even if you think you know how the DOD works, read the narrative alongside the slides. I learned a lot. you can’t see the narrative click here. The second week started with the 8 teams presenting what they learned in their first full week of class. Team Capella is launching a constellation of synthetic aperture radar satellites into space to provide real-time radar imaging. This week the team tested whether other beneficiaries – the Coast Guard and the Oil and Gas industry might be interested in their solution. Great learning. Team LTTT (Live Tactical Threat Toolkit) is trying to enhance the capacity of foreign military explosive ordnance disposal (EOD) teams to accomplish their mission. The team is developing tech informed options for these teams to consult with their American counterparts in real time to disarm IED’s, and to document key information about what they have found. The team did a good job in starting to diagram the customer workflow and intends to gain an appreciation for the ground user challenges in accomplishing these types of missions in this weeks customer discovery efforts. The team did a good job in starting to diagram the customer workflow and their understanding of how to prioritize MVP features. Their Mission Model Canvas had a ton of learning, and their MVP engendered a lot of conversation from those who’ve been in combat and were familiar with the challenges of maintaining situational awareness under fire. 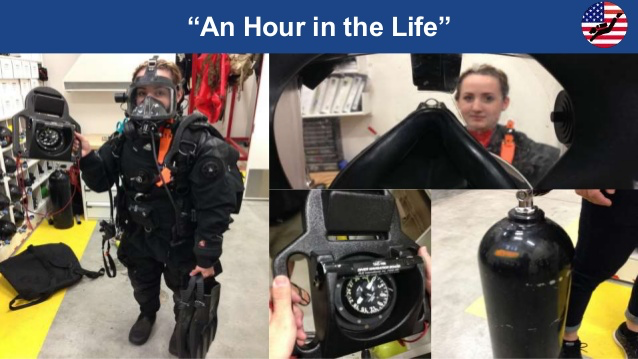 In the first week of the class this team was suiting up in full navy diving gear and doing customer discovery by spending an hour in the life of the beneficiary. They did their homework. Team Guardian is working to protect soldiers from cheap, off-the-shelf commercial drones. What happens when adversaries learn how to weaponize drones with bullets, explosives, or chemical weapons? This team is actively working to identify viable responses to these battlefield inevitabilities. Team Sentinel is trying to use low cost sensors to monitor surface ships in a A2/AD environment. The team appreciates that the problem include the sensors as well as the analytics of the sensor data. Really good summary of hypotheses, experiments, results and action. After talking to teams in office hours (the teaching team meets every team for 20 minutes every week,) and watching teams present, and then seeing a team send a sponsor an email that read like a bad business school sales pitch, we realized some students had skipped their homework/and or still hadn’t grasped the basics of Customer Discovery. As a reminder, we run the class as a “flipped classroom” – the lectures – the basics of Customer Discovery and the Mission Model Canvas – are homework watched on Udacity and on Vimeo. It was painfully clear that many of the students hadn’t done their homework. We plan to remedy that in our next week class, warning the students that we will be cold calling on them to show us what they learned. Part of the student confusion about customer discovery was the fault of the teaching team. We normally hold a “How to Do Customer Discovery” evening workshop, but we got caught by a tight spring break schedule and we punted this workshop to hold the DOD/IC workshop. In hindsight it was a bad idea – we should have found a way to hold both. We will remedy that by giving an abbreviated workshop first thing next week in the classroom. All of these were problems we’ve seen before and we’re course correcting quickly to solve them. But, given the new form of the class we had a few problems we hadn’t encountered. First, some teams were stymied by the classified nature of the specific data sets they thought they needed to understand the customer problem and build MVPs. In every case, what they lacked was a deep understanding of the customer problem. Which simply required going back to the basics of customer discovery. Second, a few teams were truly blocked by a few sponsors who were also having a difficult time understanding the role they played in Customer Discovery and required follow up clarification by the teaching team and H4D military liaison officers. A few DOD sponsors believed they were not only the gatekeepers to the problem but were the sole source of information for our teams. Given they were supposed to maximize the number of beneficiaries the teams were supposed to talk to, the teaching team jumped on this and rapidly addressed it. In another case the sponsor so narrowly defined the problem that it was viewed by the team as providing incremental changes to a solution they already have. After discussion the sponsor agreed that the team should focus on the realm of possible and how they would address the problem if there was not a current solution in place and in the process define new plans for how the solutions could be used. In other cases a few of our sponsors had difficulty generating the leads and contacts within their own ecosystems that were necessary to sustain our teams’ customer discovery beyond the sponsor’s primary contacts. Ultimately teams are required to interview 80-120 beneficiaries, advocates and stakeholders (customers). This is a heavy lift if the sponsor has not thought through who those people are and where they will be found. Finally, one of our problem sponsors departed their organization and was replaced by an alternate. This created some lag time in reestablishing contact and effectively interacting with the team. Next time we’ll designate a primary and secondary sponsor – the pace of this course requires this. For us, this was a good learning opportunity to understand the type of sponsor education we need to do in the next class. The advanced lecture for week 2 was on the Value Proposition Canvas – finding product/market fit between Beneficiaries (customers, stakeholders, users) and the Value Proposition (the product/service) in a DOD setting. Pete Newell started the lecture with a video from his time in the Army’s Rapid Equipping Force. Who are the primary beneficiaries? Who are the other beneficiaries? To the military vehicle Program Manager? Pete’ s experienced based vignettes and discussion helped the students appreciate the sometimes competing nature of the interests of a diverse array of beneficiaries. When your customers are grabbing your Minimal Viable Product out of your hands, it’s time to launch the product. The latest guests on Entrepreneurs are Everywhere explained why. The radio show airs on SiriusXM Channel 111 (weekly Thursdays at 1 pm Pacific, 4 pm Eastern). It follows the journeys of founders who share what it takes to build a startup – from restaurants to rocket scientists, to online gifts to online groceries and more. The program examines the DNA of entrepreneurs: what makes them tick, how they came up with their ideas; and explores the habits that make them successful, and the highs and lows that pushed them forward. Listen to the full interviews with Brandon and Jack by downloading them from SoundCloud here and here. Brandon Bruce is a co-founder of Cirrus Insight, a plugin for Gmail and Outlook that allows Salesforce apps to be used inside an inbox. Before starting Cirrus Insight, Brandon was director of gifts and grants at Maryville College, and operations manager of Rangefire Integrated Networks. One customer found the website — they weren’t supposed to find it. … They put their credit card in and paid for the app. We said, “We’re not going to charge you yet. We’ll refund the money.” They said, “It’s OK, I’m going to buy it once it’s for sale so I’ll be your first customer.” That was a vote of confidence. We figured there’s a company behind the app. Brandon: That’s exactly what they said. I’m glad that they did because it got us to market first; we captured a lot of mind share. People said, “Well, if you want Gmail and Salesforce, then Cirrus Insight is the app for you. We thought, “Well, that’s a big win for them. There’s value there in the marketplace, so we decided to get it out. Before opening The Root Café with his wife Corri in 2011, Jack Sundell was in the Peace Corps. Stationed in Morocco he taught English and organized activities at an after school youth center. When he returned home to Arkansas, he volunteered at the Heifer Ranch in Perryville and quickly fell in love with producing and cooking fresh food. Jack: We learned a lot about hard work, about the importance of working to build community, the importance of building capital on the front end and trying to stay out of debt. The real driver was that we wanted to fund the café without borrowing money, so we decided to spend these three years doing a capital campaign. We would do things like fundraisers where we would just invite a lot of friends to come and they would donate to this project. We did canning and food preservation workshops. We did catering out of a church kitchen. We also did something we called the share campaign, which was a lot like a kick-starter or a crowd-funding campaign, where we basically pre-sold our food and promised that for every $10 that someone donated, we would pay them back with a meal once we opened. Steve: So while raising money, you were running a branding and a customer-acquisition campaign. People knew you were going open a restaurant for three years? Jack: Right! It helped us build a great mailing list. It helped us get our brand out there. It helped raise awareness of local foods in general, so all of those things turned out to be really great. It also helped us create a network of farmers, which was another one of those things that we didn’t realize was important, but through all the catering work we had done and the food preservation workshops, we had connected with lots and lots of the farmers that deliver to Little Rock. Steve: Those farmers are your supply chain? Jack: Right. We purchase every week from 25 or 30 different farmers and producers and on an annual basis, maybe 50 or 60. There is no way that we would have had time to establish all those connections once we were in the trenches of actually opening a restaurant. Steve: These partners sold your product for you because it complemented some of the other products they sold? Brandon: Yeah. Our partners are Salesforce consultants. They’re implementing Salesforce and would tell the client, “This is the way to boost Salesforce. “You’re using Gmail or Outlook, and you’re scheduling appointments with customers on the calendar. That’s where you live, and all that data really needs to go into Salesforce and vice versa so you need Cirrus Insight”. … and those folks help drive a lot of sales for us. So we use a partner channel, we do telesales and we do a lot of email. … Ryan and I … both have young kids and we decided well, so far, so good. We’re about a year into building the company and let’s take the kids to Disneyland and, of course, it’s while we’re at Disneyland that it’s one of the biggest power outages in history took our app down as well as Netflix and Instagram and Foursquare and other far better-known apps down. For 30 seconds or so, we thought maybe we’d have a breakout sales day because we had about 100 calls and then we figured, no, something’s actually wrong. Meanwhile, our customers cared that Cirrus was down. We thought, it’s a must-have application now for companies. Once we had figured out that we were going to go forward with the idea of opening a café, I worked in a couple of places in Little Rock that were really similar. Kind of the fast, casual model where you order at the counter, find a seat, they bring you your food. I picked a couple of those places in Little Rock that I thought would be good for learning my way around. … (It was) a lot of trying to learn how orders happen, how did they make sure they had the food they needed to produce the menu every day, how did they make the schedule so that employees knew when to come to work. … It was a huge learning experience…. Behind the veil of a restaurant there’s a lot of things that go on that once you see and you realize, “Gosh, that’s really a smart way.” It’s not that every restaurant reinvents the wheel. There’s almost never a situation where someone opens a restaurant without ever having had any contact. This is all knowledge that’s been passed down over generations. Jack: Really when we started there was this goal, and we did whatever felt right at each turn to reach it. If I had known, for example, when I was in college that I would be operating a restaurant some day, I would have loved to take some accounting and bookkeeping courses. It would be so helpful to know more about electrical and plumbing (because) anything that I have to pay someone $75 an hour to fix now, when it goes wrong, I’d love to be able to do that myself. Steve: How many people do you have? Jack: When we started, there were about four. My wife and me, and two employees, and now we’re at about 18. … We have a front of house staff, we have a back of house staff, so it’s just a really steep learning curve, how to attract, how to motivate, how to maintain great relationships with employees because really, if you think about it, employees are your ambassadors. They’re your representatives all the time, and if you’re ever not going to be there, you have to trust that your employees are going to do the kind of job that you would do if you were there. Trying to teach that, trying to verbalize it, trying to instill it as a philosophy, we found it to be a really difficult thing. It’s a challenge but it’s also really rewarding, and now we have really an incredible staff that we’ve built, it’s taken us four and a half years to get to this point. But we’re open today and I was able to come to New York to do this interview, so I think we’ve come a long way. Next on Entrepreneurs are Everywhere: Michael Mondavi, founder and coach of Folio Fine Wine Partners, and Magdalena Yesil, founding investor and board member of Salesforce. We just had our first Hacking for Defense class and the 8 teams have hit the ground running. They talked to 86 customers/stakeholders before the class started. Hacking for Defense is a new class in Stanford’s School Engineering, where students learn about the nation’s security challenges by working with innovators inside the Department of Defense (DoD) and Intelligence Community. The class teaches students the Lean Startup approach to entrepreneurship while they engage in what amounts to national public service. Hacking for Defense uses the same Lean LaunchPad Methodology adopted by the National Science Foundation and the National Institutes of Health and proven successful in Lean LaunchPad and I-Corps classes with 1,000’s of teams worldwide. Over 70 students applied to this new Stanford class and we selected 32 of them in 8 teams. One of the surprises was the incredible diversity of the student teams – genders, nationalities, expertise. The class attracted students from all departments and from undergrads to post docs. Before the class started, the instructors worked with the Department of Defense and the Intelligence Community to identify 20 problems that the class could tackle. Teams then were free to select one of these problems as their focus for the class. Most discussion about innovation of defense systems acquisition starts with writing a requirements document. Instead, in this class the student teams and their DOD/IC sponsors will work together to discover the real problems in the field and only then articulate the requirements to solve them and deploy the solutions. As the teams presented the teaching team offered a running commentary of suggestions, insights and direction. Unlike the other Lean Launchpad / I-Corps classes we’ve taught, we noticed that before we even gave the teams feedback on their findings, we were impressed by the initial level of sophistication most teams brought to deconstructing the sponsors problem. Team aquaLink is working on a problem for divers in the Navy who work 60 to 200 feet underwater for 2-4 hours, but currently have no way to monitor their core temperature, maximum dive pressure, blood pressure and pulse. Knowing all of this would give them early warning of hypothermia or the bends. The goal is to provide a wearable sensor system and apps that will allow divers to monitor their own physiological conditions while underwater. Team Guardian is asking how to protect soldiers from cheap, off-the-shelf commercial drones conducting Intelligence, Surveillance and Reconnaissance. What happens when adversaries learn how to weaponize drones with bullets, explosives, or chemical weapons? Slides 6 and 7 use the Value Proposition canvas to provide a deeper understanding of product/market fit. Slides 6 – 8 use the Value Proposition canvas to provide a deeper understanding of product/market fit. Team LTTT (Live Tactical Threat Toolkit) is providing assistance to other countries explosive ordnance disposal (EOD) teams – the soldiers trying to disarm roadside bombs (Improvised Explosive Devices – IEDs). They’re trying to develop tools that would allow foreign explosive experts to consult with their American counterparts in real time to disarm IED’s, and to document key information about what they have found. Team Narrative Mind is trying to determine how to use data mining, machine learning, and data science to understand, disrupt, and counter adversaries’ use of social media (think ISIS). Current tools do not provide users with a way to understand the meaning within adversary social media content and there is no automated process to disrupt, counter and shape the narrative. Team Capella is launching a constellation of satellites with synthetic aperture radar into space to provide the Navy’s 7th fleet with real-time radar imaging. Besides working with their government sponsors, each team has a dedicated industry mentor. One of the surprises was the outpouring of support from individuals and companies who emailed us from across the country (even a few from outside the U.S.) volunteering to mentor the teams. Each team is also supported by an active duty military liaison officer drawn from Stanford’s Senior Service College Fellows. Another source of unexpected support for the teams was from the Secretary of Defense’s DIUx Silicon Valley Innovation Outpost. DIUx has adopted the class and along with the military liaisons translate “military-speak” from the sponsors into English and vice versa. The first advanced lecture was on Beneficiaries (customers, stakeholders, users, etc.) in the Department of Defense. Slides 4-7 clearly show that solutions in the DOD are always a multi-sided market. Almost every military program has at least four customer segments: Concept Developers, Capability Managers, Program Managers, Users. Each team is keeping a running blog of their customer interactions so we can virtually look over their shoulder as they talk to customers. From the look of the blogs week 2 is going to be equally exciting. Check in next week for an update.